There’s a lot more to David Hockney than just paintings of swimming pools. So, why is he so important? David Hockney is one of the most important painters of the 20th century. If you were to Google, famous British painters, there’s a good chance that Hockney’s name will appear. Born in Bradford in 1937, Hockney was one of the big artists involved in the pop art movement in the 1960s. Pop art was a style of art that was bright, full of colour. It was made by lots of young artists who felt that the art they saw in galleries was a little bit boring. To find out more about pop art, watch our handy video. It’s likely that you’ll learn about pop art in school and then you can mention Hockney and impress all your friends and teachers. What does he like to paint? Hockney lives in London, but owns two other homes in California. You can imagine then that a lot of his work varies, because California and the UK are very different places. California is usually always sunny, where as in England the weather changes all the time. So, when painting in England, Hockney likes to paint the seasons. 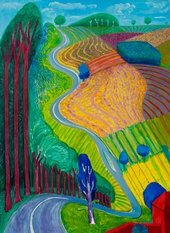 In Going Up Garrowby Hill, Hockney has painted a canvas of the landscape in Yorkshire, where he was brought up. There are lots of different colours. Why do you think this? When in California, his paintings are colourful and bold. In A Bigger Splash, Hockney paints a swimming pool. It looks like someone has just jumped into the water. The blue is so bright that you want to get on the diving board and jump in too. And look at how tall those palm trees are! You won’t find palm trees like that in England. Does he like painting people? Yes! Lots of Hockney’s work involves painting people he loves. This is usually pairs of people. My Parents is a painting of his mum and dad and is probably one of his most famous. Look at how he illustrates their personalities. His mother sits upright and attentive, while his father is absorbed in his paper and seems a little bit on the edge of his seat. It’s like Hockney has captured how he feels about his parents in a painting that will last forever. Hockney wants to capture his relationships with the people he knew. Many of his paintings are of men that he loved and spent time with. Like the painting of his parents, they show a tenderness towards the people who really mattered for Hockney. This includes his friends and other couples Hockney admired. In George Lawson and Wayne Sleep, Hockney shows Wayne, a dancer, and his partner George. The way Wayne, who is framed in the doorway, gazes at George shows a look of love that Hockney clearly felt was important to share. So, where is Hockney today? Hockney is still painting and trying lots of new experiments with art. Some of his most recent work includes painting on iPads. The great thing about iPads is that once the work has been complete, you can go back and see how the painting was created. It’s like rewinding time. Isn’t that incredible? How do you feel about Hockney’s work? Why not try picking up a paintbrush or iPad and start painting like Hockney. Start with bold colours and paint your local swimming pool and your local park. Or, if you like painting people, maybe start by painting your family. Try and show how you feel about them in your painting.